We thank the Canadian media who have been strong supporters of the Lifesaving Society's drowning prevention campaign nationally, regionally and locally. If you can't find what you're looking for here, contact the Society's public education director Barbara Byers at 416-490-8844 during office hours or at 416-727-5636 (cell). Toronto, ON – July 20, 2017 The Lifesaving Society, Canada’s leading organization responsible for drowning prevention, has launched an online boating safety program targeted to new boaters, particularly new Canadians who may be experiencing recreational boating for the first time. STARTboating is a comprehensive program designed to teach basic boating and water safety skills. The program will launch today in English, French, Mandarin, Cantonese, Hindi and Tagalog. STARTboating consists of a series of online, interactive videos, which guide the user through the basic skills needed to safely enjoy a day on the water. While suitable for all boaters, the program was developed with Canada’s growing immigrant population, especially newcomer families, in mind. Toronto, ON – June 28, 2016 English / Français – A new study commissioned by the Lifesaving Society, Canada’s leading organization responsible for drowning prevention, has found tweens (aged 11-14) who are new to Canada are five times more likely to be unable to swim than their Canadian born classmates. 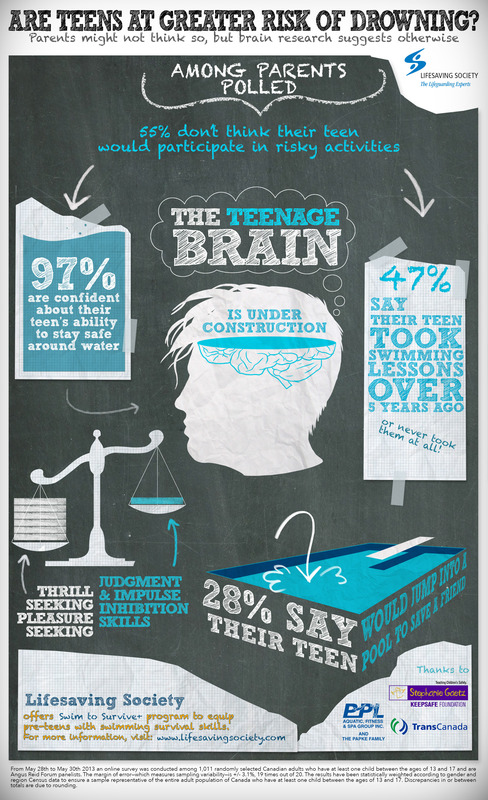 The study also found that despite this, 93% of new Canadian tweens say they participate in activities in, on or around water. The new study, “The Influence of Ethnicity on Tweens Swimming & Water Safety in Canada” was conducted to better understand the attitudes and behaviours of Canadian tweens around swimming and water safety, both new Canadians and those born in Canada. The study builds on important research commissioned by the Society in 2010, which found that new Canadian adults were four times more likely to be unable to swim than those than those born in Canada. The research is timely as Canada welcomes increasing numbers of immigrants from countries around the world. Close to 30,000 Syrian refugees will be celebrating their first Canada Day on July 1. In fact, Statistics Canada projects that the new Canadian population will continue to rise, reaching between 25% and 28% in 2031. That means at least one in four people living in Canada could be foreign born. WHO report: drowning among top causes of death for children worldwide. Download the Global Report on Drowning: Preventing a Leading Killer. Programs like Lifesaving Society's Swim to Survive could have immunization-like benefit. Toronto, ON - June 4, 2015 (Version Française / Chinese) - The World Health Organization (WHO) has released its first-ever global report dedicated exclusively to drowning - Global report on drowning: preventing a leading killer. The report covers drowning in all countries of the world, across all ages. Among the findings: drowning is one of the ten leading causes of death for children and young people in every region. In Canada, the Lifesaving Society - the lead organization responsible for drowning prevention - notes that it's the second leading cause of preventable death for children under the age of 10. Teaching school-age children basic swimming, water safety and safe rescue skills is one of the Ten Actions to Prevent Drowning specifically identified by the WHO report. "Teaching young children basic survival swimming skills can have a life-long immunization effect against drowning," says Dr. Stephen Beerman, a Canadian doctor and researcher who contributed to the report. "The Lifesaving Society's Swim to Survive program is an excellent example of how an organized, community-based approach can have an impact on generations of children. The program is a great model for other countries in the world." In 2005, the Lifesaving Society developed Swim to Survive, a school-based program that teaches grade three students three critical skills needed to survive an unexpected fall into water. The program resulted from the Lifesaving Society's vision that every child in Canada should learn basic survival swimming skills. In a country blessed with so much water, swimming skills are essential. "Spending time in and around water is a fact of life in Canada, and every child deserves the chance to learn basic swimming skills," says Barbara Byers, Public Education Director of the Lifesaving Society. "Acquiring these basic skills is a fundamental requirement in any meaningful attempt to eliminate drowning in Canada. Our goal is to reach every grade three student and arm them with the skills to help keep themselves safe. We are proud of the success of the Swim to Survive program, we are working towards expanding the program across Canada." A recent Angus Reid Forum survey conducted for the Society found that 97% of Canadians agree swimming is a life skill that every child should learn, and 88% agreed that all children should receive swimming instruction as part of a school safety program. Globally, an estimated 372,000 people drown each year in what the WHO describes as a serious but neglected public health threat. While the impact from drowning is significant compared to other public health challenges, the report notes there are no broad, organized global strategies for prevention. The WHO report calls for both global and local communities to work together to introduce strategies aimed at promoting water safety and drowning prevention. Its Ten Actions to Prevent Drowning include community-based actions, areas for policy and legislation, and research priorities. The Lifesaving Society actively supports the strategies recommended in the WHO report including data collection and research; promoting prevention strategies such as four-sided fencing; and drowning prevention education programs that teach swimming skills to children. This year marks the 10th anniversary of the launch of the Swim to Survive program, which teaches three basic skills in sequence: roll into deep water, tread water for 1 minute, and swim 50 metres. Funding for the development of the program was made possible by a grant from the Stephanie Gaetz Keepsafe Foundation. In its inaugural year, with funding from the York regional government, approximately 3,000 grade 3 students from across Ontario's York region participated in the pilot program. In 2006, the Ontario Ministry of Education gave the Lifesaving Society close to $1 million dollars to fund a province-wide school grant program. The Ministry has continued to support the program each year since then. Currently, the program is funded by the Ministry and many other government and community partners. This funding has enabled almost 670,000 children from 50 school boards, across 93 municipalities in Ontario to participate in the Swim to Survive program. The program continues to grow and is now available in all provinces across Canada. The Lifesaving Society is a full-service provider of programs, products and services designed to prevent drowning. We save lives and prevent water-related injury through our training programs, Water Smart® public education, drowning prevention research, aquatic safety management and lifesaving sport. Each year, more than 1,000,000 Canadians participate in the Society's swimming, lifesaving, lifeguarding and leadership programs. The Global report on drowning is the first World Health Organization report dedicated exclusively to drowning - a highly preventable public health challenge that has never been targeted by a global strategic prevention effort. This report aims to change this. It sets out current knowledge about drowning and drowning prevention, and calls for a substantial scaling up of comprehensive efforts and resources to reduce what is an intolerable death toll, particularly among children and adolescents. For more information download the report. Toronto, ON - June 25, 2014 (Version Française / Chinese) - This summer, the Lifesaving Society is helping to remind parents and caregivers of young children about the importance of water safety by introducing the new ON GUARD card, which identifies who is "on duty" when children are near or in the water. The card is meant to remove any doubt about who is responsible for minding the children, with a goal of reducing accidents or death by drowning. "Year after year we see tragic cases of drowning involving toddlers and young children," said Dr. Dirk Huyer, Chief Coroner for Ontario. "In our 2010 report, we made preventative recommendations regarding supervision, wearing approved personal floatation devices and teaching swimming at the earliest age possible." Public education campaigns targeting parents and/or caregivers of infants, toddlers and school age children are critical. Prevention initiatives, like the ON GUARD card, stress the need for direct and continuous supervision any time a child is in or near water. Most people believe that they will be able to recognize a drowning child because they will cry for help or splash and wave their arms. In fact, a child in distress is more likely to slip quietly under the water, unable to call or reach out for help. Drowning can happen quickly and quietly and go unnoticed even when people are nearby. The ON GUARD card is designed to help ensure that parents and caregivers are especially vigilant while supervising young children and non-swimmers in or around water. The plastic card is worn on a lanyard around the neck and provides very specific tips to help parents and caregivers understand their role and supervise as effectively as possible. Those who wear the card are responsible for committing 100% of their attention to their role as supervisor and for finding another adult to relieve them if they need to turn their attention away for any reason. The card includes the pledge: "People ON GUARD pledge to maintain constant and vigilant supervision until relieved of duty". "Young children and toddlers have a natural curiosity and an almost magnetic attraction to the water," said Barbara Byers, Public Education Director for the Lifesaving Society. "They are conditioned to think of water as a place for fun - like playing in the bath tub or splashing in a pool - and this can give them a false sense of security. Parents and caregivers must pay close attention when children are in or near any kind of water. We developed the ON GUARD card to help make it crystal clear which parent or caregiver is responsible for supervising and to provide tips to make sure that they are supervising effectively." In fact, pediatric experts support the idea that young children are impulsive around water and that their young brains are not capable of recognizing risk. "Young children, especially under the age of five can be very impulsive, especially when excited" says Dr. Jean Clinton, an Associate Clinical Professor, Department of Psychiatry and Behavioural Neuroscience at McMaster University, division of Child Psychiatry. "Their focus is on what appeals to them in their immediate situation. They don't have all the thinking skills developed yet to understand potential danger or the consequences of their actions. They can recite the rules for safety but when they are excited they may not truly retain water safety skills and know when to apply them. As parents and caregivers, it's IMPERATIVE that we recognize these limitations and protect them." Clinton adds, "The ON GUARD card is an important tool because it is a tangible reminder that really reinforces what our role is in that moment and ongoing as parents and caregivers. We are ultimately responsible for the safety and well-being of those in our care." Individuals or organizations can purchase the ON GUARD water safety card online at www.lifesavingsociety.com or by calling the Lifesaving Society directly at 416-490-8844. The card costs $7.50 each or $125 for 25 cards. 1. Office of the Chief Coroner for Ontario. Drowning Review. A Review of All Accidental Drowning Deaths in Ontario From May 1st to June 2011. 2. Canadian Drowning Report. 2013 Edition. Prepared for the Lifesaving Society by the Drowning Prevention Research Centre Canada.